My water broke in the morning. I was in the middle of my contractions, scared but excited of becoming a mother for the first time. Suddenly, I realized that I was dying for some good old Mexican food. Yep, that is me – thinking about food at the most inappropriate times. I had been warned about a no-food policy for women in labor. Getting to the hospital too early meant meeting my daughter on an empty stomach. Getting there too late meant going through a rather painful labor without the epidural. I was faced with a very difficult decision to make. So, with the frequency of my contractions down to only 5 minutes, my husband and I headed to a local burrito joint. There, I bought the largest steak burrito on the menu and gobbled it down in less than two contractions. Later that night, Mika was born. Yes, I really like Mexican food. I love burritos, tortilla soups, enchiladas, guacamole, fish tacos, salads, you name it…. 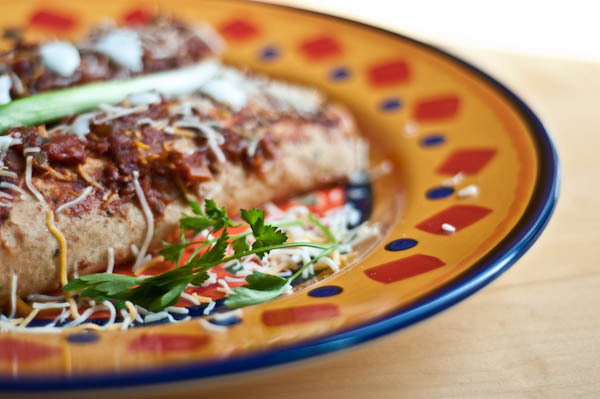 Before children, we frequented Mexican restaurants and taquerias, often indulging in hearty but not so healthy cuisine. 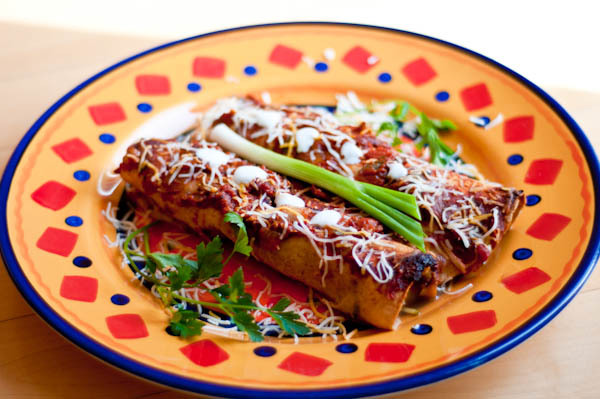 Since then, I have adapted many Mexican dishes to make them both kid friendly and healthy. I make to-die-for vegetarian enchiladas, a super-authentic-but-half-the-salt tortilla soup and a gimme-seconds-please veggie taco salad. 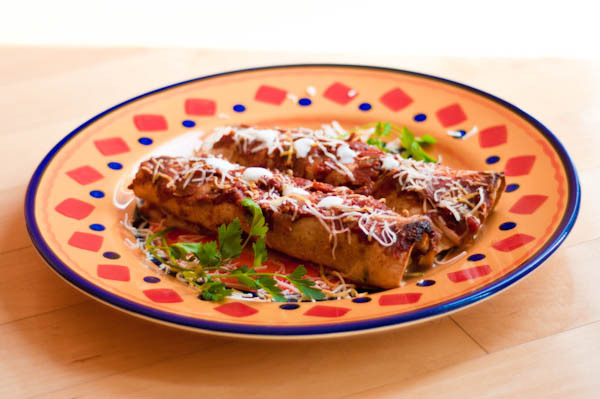 Here is a recipe of the delightfully unique healthy enchiladas that my son loves just as much as I do (or maybe even more.) This recipe makes a lot (leaving you with over 2 days worth of leftovers.) 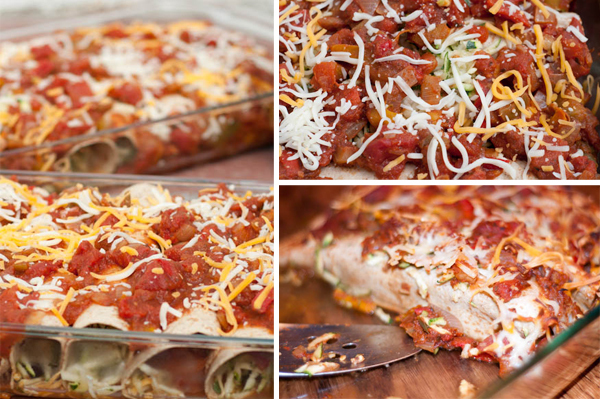 You can make the sauce 2 days in advance and assemble everything the day you serve these delicious baked wraps. Or, if you don’t want to make so much all at once, you can roll the entire batch in advance and bake portions over several days. Put tortilla on a plate and place a heaping 1/3 cup of grated zucchini, a few slices of olives and 1-2 tablespoons of cheese in the middle. Roll the tortilla up and place it seam-side down in 1 of the casseroles. Repeat to fill the remaining tortillas, laying them side by side in the casseroles. Preheat the oven to 350 F. Bake, uncovered, for 30 to 40 minutes, until bubbling hot. Serve hot from the oven or warm. Or cool to room temperature, cover, refrigerate, and reheat on site. This recipe looks absolutely fabulous. Healthy and delicious! Thanks for your visit, you have such a nice blog here!!! I read the story, you must be really in love with food!! so nice!! Tomorrow I will go shopping to make them sunday…I will let you know! I cooked your enchiladas, they were super super delicious!!!!!! They are super delicious! My boyfriend don’t like olives and zucchini and he loved them so much..thanks for the recipe!! 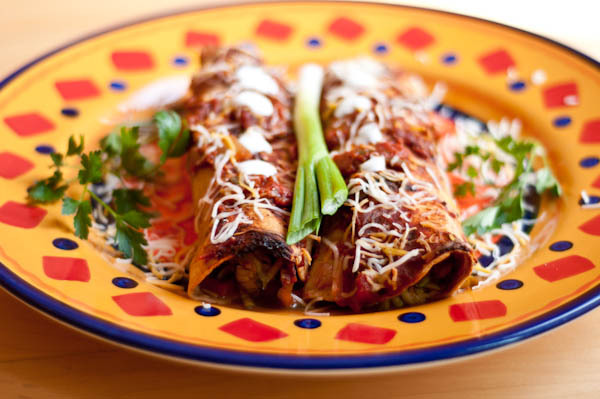 I am so happy that you and your boyfriend loved a healthy variation on traditional enchiladas! Thank you for a wonderful review! I REALLY need to try making these! So many of my favorite ingredients. Plus, I could eat Mexican food three meals a day. :) One question though: when I’ve cooked with shredded zucchini before, I found that it contains so much water, and some recipes call for draining/pressing the zucchini before adding it to the dish so it doesn’t turn out soggy. Do you find the need to do this?